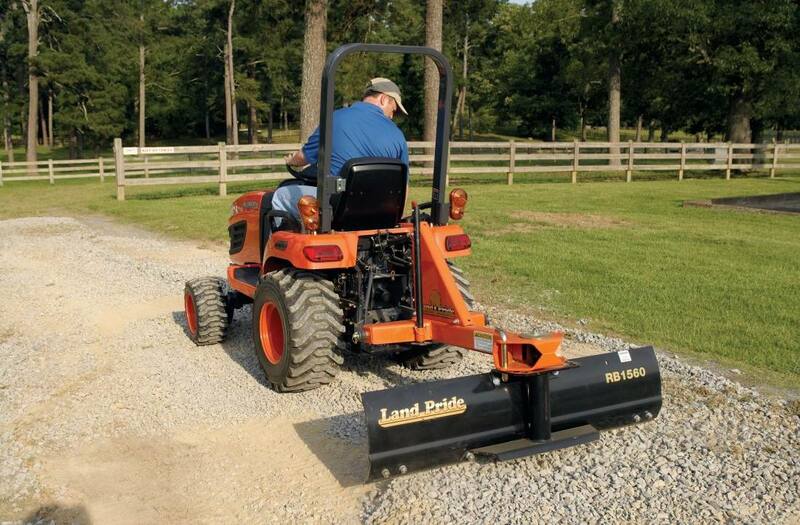 Land Pride's RB15 Series Rear Blades are an excellent and economical choice for applications in leveling, finish grading, and backfilling at feedlots, outdoor arenas, building sites, nurseries, and maintenance operations on farms, ranches, and home owner lanes and roadways. The multitude of forward and reverse working angles as well as moldboard offset capability allows the operator to work right up next to retaining walls, abutments and raised curbing. They are excellent for snow removal in the pulling or push blade mode. A retractable parking stand is included to accommodate easier blade removal, storage and remount capabilities. Warranty: One year parts & labor. 60", 72", 84" Working widths: Choice of three sizes to pick from. Quick Hitch: Fits Land Pride Quick Hitch. Blade angles left and right up to 45° in forward position and 30° in reverse position: (7 Forward positions in 15° increments and 5 reverse positions in 15° increments) Many angles for diverse jobs and results. Blade offsets 12" left and right: Manually move moldboard to cover either tractor tire. 14" High rolled moldboard: Rolled moldboard allows material to flow easily, which means less drag, less HP. 1/4" moldboard thickness Is just right for 40 HP work. Reversible cutting edge: For twice the life. Parking stand: Store unit with front of hitch off the ground, allows for easier hook-up. Skid shoes (optional): Set depth of blade to clear obstructions like manhole covers, street cracks. Landscape Rake adaptable: Remove moldboard and add rake element to add diversity of frame. S/N 872034+ is compatible with QH05.